Glenda Standeven and her husband have lived in Chilliwack, BC, for 26 years. Five years into their marriage, Glenda and Rick had a beautiful three-year-old son and were looking forward to adding to their family soon. That was what brought Glenda to the doctor in the first place: she wanted to get pregnant and wanted a clean bill of health before taking the plunge into parenthood again. She had a slight pain in her hip that she never dreamt would life threatening. Glenda was diagnosed with bone cancer when she was 31 years old. After Glenda was told that she would lose her leg, she had a dream that would set her life on a new, inspiring, and fulfilling path. She describes her dream of a “life on one leg” as “filled with accomplishments…I saw myself falling down but there were always strong arms there to pick me up. I saw a life filled with challenges ad triumphs.” When she woke up the first she did was reach for her journal and wrote down these words: “after the dream I had last night I know I am going to lose my leg and it’s going to be okay. She lost her entire right leg (including her hip and pelvis) in 1988 and has risen above the many obstacles and barriers she’s faced over the years, just like her dream predicted. She overcame cancer and hep C, which she contracted from her blood transfusion during surgery. And, later she miraculously did give birth to her second son. Now Glenda shares her wit and wisdom in overcoming life’s hurdles. She blends a combination of practicality and humour towards living life to the fullest. 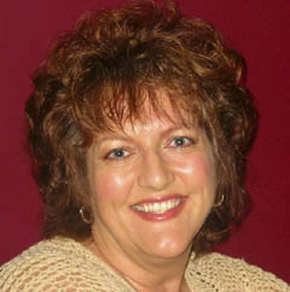 She has become an accomplished speaker who has delighted audiences of all ages for over 20 years. In Oct of 2009 Glenda had her first book published, titled ‘Who’s Chasing Me?’ a beautifully written children’s story about friendship, imagination, and facing your fears. 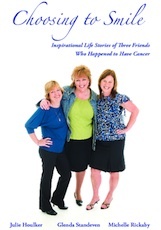 She will be releasing an autobiography with two other cancer survivors, entitled ‘Choosing to Smile’ in March 2010. She speaks on a wide range of topics from finding the humour in living life as an amputee; putting the Power of Positive People (P.O.P.P) in the Workplace; to discussing the rewards of volunteering. She has developed her own unique ‘Smoking Awareness Program for Teens’ which helps teens decide to quit smoking or, better yet, never to start!